Join us at the beautiful Hearth and Soul Retreat Centre, nestled in the mountains near Stanford for this five day silent retreat. Using music, conscious dance, movement, listening, direct perception, deep presence, relaxation, mindfulness, nature and meditation as tools to enter into deep communion. Re-Treat yourself to an experience of being in the world. Shift perspective away from the intellect, ego, and logical mind and expand awareness into another way of living. A way that opens up a more connected, heartfelt, intuitive, and visceral experience of life that is closer to our true nature. Explore creating and moving from this nature so that your actions nurture all life. A human being, rather than a human doing. Just as an acorn under the right conditions becomes a great oak tree, so too we humans under the right conditions thrive into our full potential. This retreat provides a space with the right conditions. The emphasis will be on conscious dance and movement with a weaving in of practices to help nurture growth, explore yourself, and build bridges between all aspects of your life. A time of deep rest, rejuvenation, inspiration, and creativity. Immerse yourself. This is a retreat and not a workshop. The only things we will process are things that arise in the moment. All welcome! Cost: R3580 including vegetarian meals and 5 nights shared comfortable accommodation. The focus of the retreat is inspired by the Ram Dass quotes found on this page. We aim to spend five days exploring what it means and feels like to us to inhabit our souls and move, act and respond to the world from here. We will gently transition into silence during the first day and come out of it on the last day. Our aim is to access the present now through movement, mindfulness, and meditation we will not bring or use our phones, tech, books, drugs, alcohol, or stimulants. Our time will be spent deepening and expanding into the experience of being present so that we can explore and awaken other aspects of our minds, hearts, and body’s that we don’t usually hear in our day to day. We will aim to cultivate deeper receptivity and listening to nature around and within us and respond to this deepening receptivity through creativity. Journals for creative writing, poetry and jotting down epiphanies as well as art materials to paint, drawer or make art will be permitted and encouraged. We will also aim bring ourselves into harmony with nature and be open to experience transmissions from higher aspects of our being. Hopefully it will be a time learn to move or practice moving in harmony with the world around and improve our ability to be an instrument of the divine flow of our life. There will be adequate time to rest in between sessions of movement. You do not have to have a certain level of fitness just a willingness to perhaps push through a few edges in the spirit of adventure. All are welcome on this retreat. Please feel free to contact us with any questions you have about the retreat. Please book early to avoid disappointment as space is limited to a maximum of 20 participants. 07:00- 08:00 Conscious waking, stretching, moving, yoga and breathing. 08:00 -9:30 Breakfast and nature time. 20:30 Free time and sleep. The daily practices will change from day to day, each day will have a specific focus or aspect of exploration and intention, building an integrated whole by the end of the retreat. There will be a breathing balance between rest and movement. On the last evening will enter into a movement ceremony allowing us to explore our edges a bit further. The retreat was wonderful, amazing, mystical and magical. It was a time of ever-present commune in peace and love. I too feel a big shift in my body. I thank you for all that you gave of self to purpose this magical weekend into being. It was truly a joyous time. Thanks again for creating such an awesome, soulful retreat! I was blown away by the power and beauty of the music… and your facilitation was a perfect blend of wise guidance and non-interference in the unfolding process. I came away feeling inspired and rejuvenated! The retreat was the best gift I have ever given myself! The combination of silence and movement was perfect for me. If something came up in me, I would dance with it, sometimes it was a gentle unfolding and sometimes a tumultuous unravelling. I found myself dancing through my relationships, and with the soul of my brother who has passed, as well as with my higher-self and realms of the ancestors, angels and demons. Other times laughing or smiling from ear to ear and just having a really good dance and celebration of life! And seeing this process in others as well was super-cool. The retreat will be held by Brian Bergman (Dancing Freedom Cape Town). 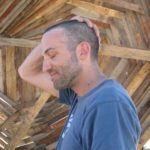 Brian has been practicing yoga, meditation and mindfulness for 18 years and has been practicing conscious dance for the last 9. He is a veterinarian, a qualified Dancing Freedom facilitator and holds a PG Diploma in Yogic Studies, from the Bihar Yoga Bharati, in India. He currently teaches yoga and mindfulness inside prisons as well as weekly Dance Awake classes and vets at an animal welfare clinic in Khayalitsha.